Sift the dry ingredients together and cut in the lard or shortening. Add enough buttermilk to make a soft dough. Pinch off about a lemon sized ball of dough for each biscuit and pat out with your hands. Bake for 12 – 15 minutes at 450 degrees or until the tops are golden brown. Remove the biscuits form the oven and put butter on the tops of the hot biscuits to coat. Picture is of a big ole plate of 'cats' full of good ole' Virginia Ham. in the fields about mid afternoon. A good biscuit, even though they only doubled in volume. See Mountain Country Cat Head Biscuits As Big As A Cats Head for additional comments. These are fantastic, I make them a few times a week, my family loves them. I have a feeling that grandma made biscuits like that. Hey Lana gonna have catheads in the morning with sausage gravey. yum maybe some blackberry jam and butter too. High 5 thanks buddy. Thank you all so much for your nice rating and comments on my recipes. Mine are mostly just like my name..country!! These sound like our family southern biscuits that have been made for generations. Thanks so much for posting it because I lost the original recipe. You are WONDERFUL! these sound amazing, what a great post! 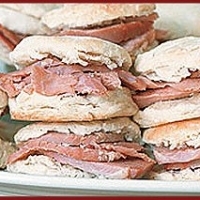 I didn't know you all would want to see these crazy old OLD recipes, and just took a chance..
served ONE biscuit with 'sawmill gravy' and a big ole sausage ..(yep thats what they called it) as a whole meal! An oldie but a goodie that we all love! My grandmother told me a story about these to. She said they would be so many workers that they had to feed at breakfast, that all the ladies made the biscuits big enough to hold ham or other meats, so that one would fill them up. My grandmother got into the habit of making them big all the time. She said some woment started making the biscuits look like catheads as a joke. I'm not sure if thats true but it was fun to listen to her stories. What a great post, lana - love the story behind it! And if you could send me some of that good old Virginia ham for some sandwiches on these delicious biscuits, I'd be your best friend forever!!!! Meow-valous!! I had a recipe for these so long ago that I forgot about it. Thanks for posting!